An Argentinean place cannot be imagined without having an Argentinean parrilla to grill the famous Argentinean asado steak and meat. 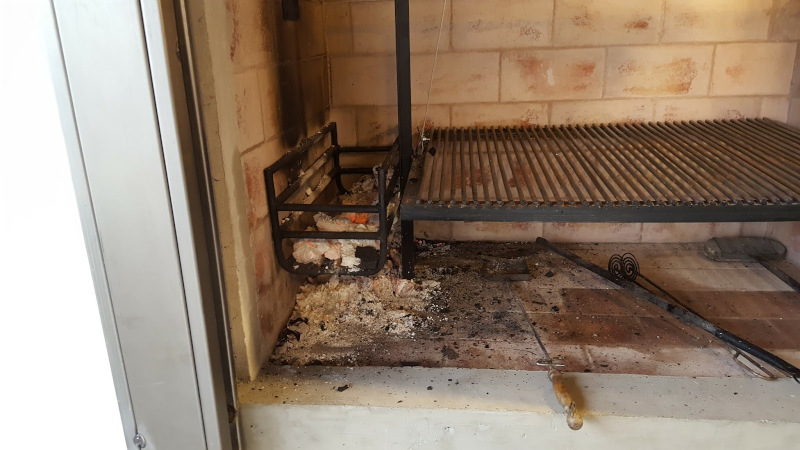 It is called a parrilla, which is an Argentinean style barbecue or grill with a rack that can be changed in height to regulate the temperature. 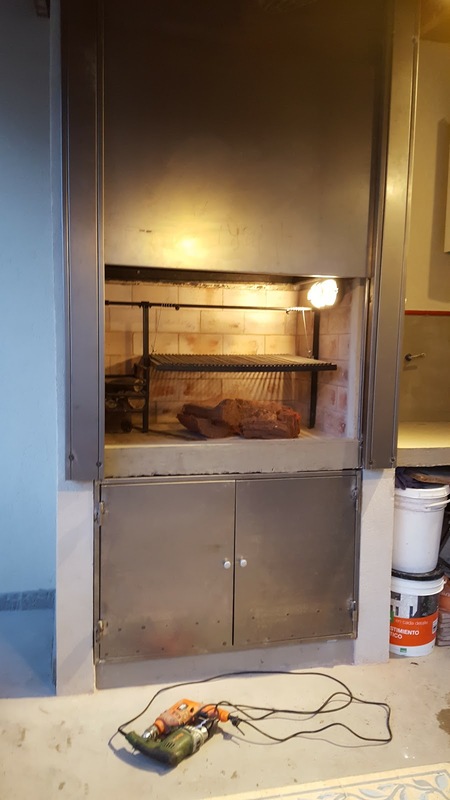 We had an existing parrilla, but that was too small (85 cm wide grill serves just about 8 persons) and decided to enlarge the parrilla to 1.5 meter with a wider grill that also included a brasero, a fireplace to burn the wood. 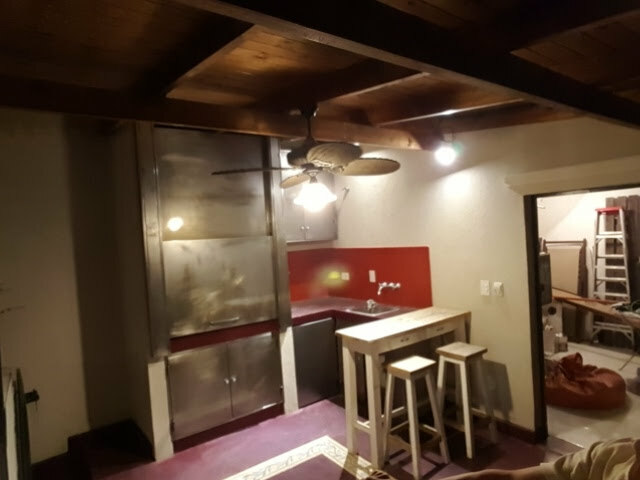 The Argentinean parrilla space is something that took some time to figure out. First, the space, a so called quincho, we fitted with a kitchen and bar table and a vertically moving door lid to close the parrilla to keep the heat in, but also to protect that the smoke and fire is not escaping through the front. We decided to get a metal look, all custom-built. The parrilla itself measures 1.5 meters wide, one side for a brasero that is needed to burn the wood and coals, so that you can maintain the heat while grilling. The main part is obviously used for the grill and its size serves easily more than 12 people. The typical measurement is 10 cm width of grill per person. For the grill, you can choose between V-shape metal grid or round grid type of grills. The V-shape helps with the fat that drips off the meat and is caught by a little metal basket in the front. This type grills is ideal for chorizo sausages as they leak oil and fat during the grilling, and avoids that the oil is burnt by the coals, causing smoke or even fire. But the disadvantage is that you have to clean the fat of the basket every time you do an asado which is not a very clean nor an easy job. The other type of grill rack is with round grids, It gets the heat better to the meat and best for large cuts of meat with little fat or oil falling down. But if used with chorizo sausages or greasy meat, you need to ensure that the place below the meat is clear from coals to avoid any smoke from the crease dropping. I used to have a V-shape type of grill rack, but after getting tired of cleaning it every time, i decided to opt for the rounded grid grill rack. The chimney is another key part of the design that needs to be well constructed. 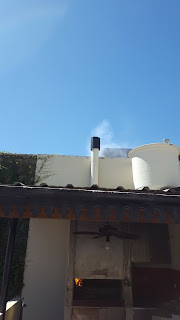 The chimney needs to be wide enough to pull the smoke out without moving it back to the grill. The surface of the chimney pipe needs to be at least 10% of the parrilla surface for best results. There are round and square chimney pipes, and opinions differ which is best. We opted for a round chimney channel, with a chimney cap that is a wider cylinder placed on the end of the chimney exit. Together with the front door lid that can close the parrilla from the front, that works out quite well to keep the smoke exit from the top. Few will acknowledge, but the connoisseurs will agree that the most important part of a good asado is the quality of the fire. There are many ways to turn on the fire, but I usually lift the grill up to a high position, put the bag of coal below the grill and create a little air chamber below this bag with either a crate of wood or some carton. Make sure the air chamber does not collapse during the first 15 minutes to get the temperature high enough to get the coals to burn. Get few sheets of newspaper, wrap them together, put it in the air chamber, and turn it one. One match should be sufficient to turn the fire on. Leave it for 25 minutes burning, then take out the largest chunk of wood and put it in the brasero to use it later. Just keep the small coals below the grill and while it is warming up, clean the grill with an old newspaper, meat crease, and a metal brush with water. Lower the grill and check with the palm of your hand if you can just keep it 2 seconds above the grill, then that is the right temperature. If the temperature if too low, put more bricks or lower the grill, or vice versa. Then it is time to put on the meat and maintain the heat by moving the smaller bricks falling from the brasero to the grill. A bag of coal typically lasts 30 minutes to start to burn well and then you have around 60 till 80 minutes of heat. The most common use for the parrilla is to have a tasteful asado with Argentinean meat. Typically, for your guests, one calculates 1/2 kilogram of meat per person, typically one part with asado (part with ribs) and other part lomo de chorizo or vacio (thick loin cuts without bone). Besides that, you also put chorizo sausages and morcilla (blood sausages). Once the coals are hot enough, you salt the meat with parrilla salt, put the meat on the grill, wait till the juices are showing coming out on top, then turn them over, and wait again till the juices show on top, and then ready to serve. Another delicious meal is fish with trucha (trout) and dorada. 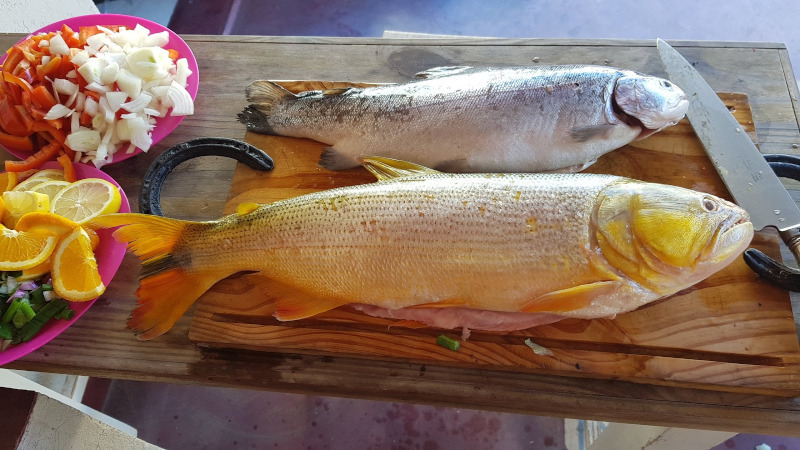 Cut the fish open, pour in the lemon and rinse it heavily with olive oil and fish herbs, use a special metal tray that helps you to turn the fish once one side is ready, and again grill on both sides. Another recipe is lechon or piglet. 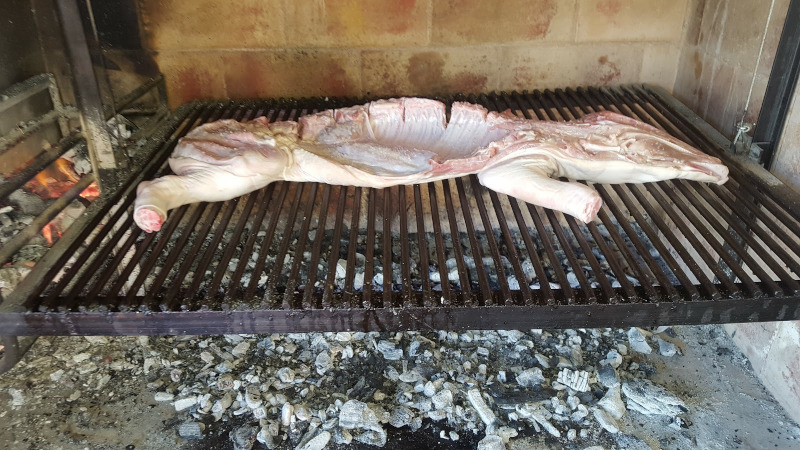 I used half a piglet of 8 kg, soak it with a lemon and put on the grill, Put a metal baking plate on top to conserve the heat and leave it for 3 hours, then turn it for another 3 hours, and you get a tasteful meal to share with your family and friends. To find out what tools and knives you need, click on the post of Parrilla Tools and Knives. And there is another post with what else you can prepare in Parrilla with meat, hamburgers, fish, pork, potatoes and piglet.